Twenty-six years ago, Skinny Puppy released their first recording, Remission, on an unsuspecting public and redefined industrial music. They had help from Ministry, as both bands would eventually become the godfathers of this heavy, strange and danceable sound that emerged in the early 80’s. Twenty-five albums later, Skinny Puppy is still going strong which isn’t bad for a band that was apparently initially supposed to be a side project for cEvin Key (born Kevin Crompton). When Nivek Ogre (born Kevin Ogilvie) joined soon after, the band became a full-time project. Dwayne Goettel joined the band from 1986-1995, and the band has had various other members, including Bill Leeb of Frontline Assembly and Al Jourgensen, over the years as well. In 1993, tensions between band members and rumors of drug abuse plagued Skinny Puppy, culminating in the death of Goettel and Ogre leaving in June of 1995. Ogre and Key reunited in 2000 for a Skinny Puppy show in Germany and then finally reformed in 2003. Currently, Justin Bennett (formerly of Professional Murder Music) is the drummer and had a key role in choosing the band’s set list for their recent “In Solvent See” tour, which ends December 10th, 2009 in Los Angeles. Recently, Nivek Ogre chatted with Maximum Ink about the dangers of touring with no album to support, animal rights, politics and his burgeoning film career. Read on. Maximum Ink: You have a movie coming out in January of 2010, 2001 Maniacs: Field of Screams. What can you tell us about that film? Nivek Ogre: It was directed by Tim Sullivan, who did the original remake, with Robert Englund playing Mayor Buckman. It’s kind of a reboot of the whole story in the sense that Bill Moseley is taking over the role of Mayor Buckman in this one. It follows the maniacs as they are confronted in the opening scene by the sheriff of Pleasantville, and he’s concerned about our eating habits. He doesn’t want us to do any more snacking by the side of the road, so he tells us that we’re done. Basically, without much ado, we roll the sheriff down a hill in a barrel of nails and leave Pleasantville. We end up in Iowa, where we start a carnival and lay down our tents and are met by kids from Hollywood, debutantes, kind of Nicole Ritchie, Paris Hilton types, and they are on a show called “Road Rascals”, trying to find out what the real south is like. They’re on route to the Pleasantville area and they happen to run into us and see an opportunity to save a lot of production money by using us for cannon fodder for their show. Unbeknown to them, they become table scraps for our supper, and mayhem proceeds in all directions from there. It’s really irreverent with a lot of tongue-in-cheek humor. I haven’t seen the final cut of it, but what I have seen turned out really good. They were going to take it to AFI but we filmed it just across from Nebraska in Council Bluffs, right on the river and archery range, so besides all the chiggers and mosquitoes, we had a pretty intense 10-day shoot. We had a good director of photography and there were some sound problems that they need to clean up a little. I think they’re doing that right now. They’ve chosen to wait until it’s actually completed before they go to AFI or wherever they take it to shop it for distribution. We’ll see, but the scenes that I’ve seen I’ve been really happy with and I obviously had a lot of fun doing it. Working with Bill and with the whole cast was very, very fun. Ahmed Best was great, Lin Shaye was wonderful and the whole group of maniacs. Adam Robataille ended up editing the film, so there were a lot of great people. It was a lot of fun. I could go on and on but it was really a good time. Max Ink: So, it’s not like the original one where they could only come out for a specific amount of time? NO: It is just that kind of thing. I think that there’s like a bit of a stretch in the sense of how do we move from here to there in a lot of ways. When you look at the tone of the film, there’s a certainly a lot of fun involved along with the gore and the terror. But we still have basically one night to come out, or a couple of nights to come out and do all this stuff, and get up to the desired 2000 northerners that will allow us to rest. In this case, there’s a bit of an interesting ending that, once again, is more humorous and will show people that there are now 2001 maniacs. 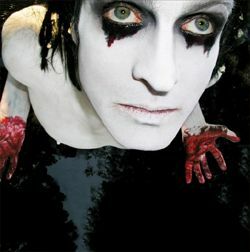 Max Ink: How does your theatrical background in Skinny Puppy help with your acting career? NO: It helps completely. I studied masks when I was younger, when I first started Skinny Puppy. I’ve always had a dream, goal or hope to sort of parlay what I do with Skinny Puppy into film. I was lucky enough to run into Darren Bousman and his Repo! The Genetic Opera and with that in hand, and the fact that in Skinny Puppy I’m always under masks and kind of articulating more with body gestures, the role of Pavi kind of became more that was given to me based on my audition. So the audition for that kind of led to this film as well. I was lucky in that I was able to use a lot of that mask work in the idea of Pavi and the transition for me was good because coming from music and doing a musical, or an opera, was great because we did tape all the vocals in L.A. a month before and then went up to Toronto to film, so we were doing a sync. It gave me the opportunity to learn on-set etiquette and to really find myself in that space without having to worry about running dialogue. It was much more of physical performance, which comes easy to me. The Maniacs movie gave me the opportunity to run dialogue and be a southern dandy sort of killer, so that was the next phase for me. It all kind of lends itself, whether you’re onstage in front of a large audience or in a closed environment with a lot of people around you, you have to be able to separate yourself from all of the other things going on around you and focus on the performance and to whom you’re directing that emotion. It’s similar but different within theater and I know some actors could never go on stage and some stage actors have trouble within the intimacy of film. I have no problem with it for whatever reason, and maybe because I’ve done so many kinds of extreme things on stage, there’s no sense of being self-conscious. It’s where I find myself now. I came a long way from being a very self-conscious person to being someone who can do that. It’s very rewarding and at the end of the day, it’s just really fun work. Max Ink: Do you have any other film projects that you are working on now? NO: Not as yet. I’m doing this tour now and once I get back and that film kind of hits, I think that’s going to open some more things. I blocked August through December with my agent for this tour and so he’s not looking for anything until I get back basically. We’re going to start looking and sending some stuff around. Once I get some exposure from the Maniacs film, it’ll be a little easier to sell me as a viable actor. Max Ink: You should go try out for True Blood. Max Ink: From what I understand, the new Skinny Puppy record is looking for a distributor? Max Ink: I’ve already looked at it. NO: Yeah, that’s what we’re working on right now within the context of that. Once the smoke clears with SPV and we know where we stand with Skinny Puppy, then we’ll move forward on a proper release and we’re hoping to sell the record based on the tenuous condition of the record industry on a whole. Max Ink: So, was it risky to go ahead and do the tour when there was no album to promote? Or is Skinny Puppy just one of those bands whose following is such that you don’t really need to have a product to promote, they’ll still come out and see the band live? Max Ink: I’ve heard from fans that the set list is mostly all old fan favorites that, like you said, haven’t really been performed live much or at all. I think that’s one reason everyone is so excited, because they get to see all their old favorites. Max Ink: Skinny Puppy is considered a pioneer of the industrial scene, so how do you feel about how that scene has evolved? NO: I think, in America anyway, it kind of went the way of hybrid metal. I think Ministry took the reigns of that, as Nine Inch Nails did. They kind of hybridized it into something that was more about guitar riffs and with computers and synthesis around it, which kind of gave a face-lift to metal. But it didn’t do that much for actual industrial music. The true focus of industrial music is that there are no rules and I think that in America, and in Europe to a certain degree, it became very laden down by a certain costume and a protocol and how to act and how to play things and what needs to be an industrial song. If you go back to Throbbing Gristle and things like that, there were really no rules and whether you used a vacuum or a guitar, there was no sense of it has to sound this way or it had to have this type of sounding bass or this type of sound of snare and kick. You see that, it starts to happen with any genre. Whether it’s alive and well, I don’t know. In an odd way, I’m kind of an odd bird in the sense that I didn’t think that I’d be doing this at this point in my life. I didn’t think I’d be on a bus talking to you right now. I’m almost 47 years old and kind of pontificating about where industrial music is now, so I think it isn’t the biggest genre in the world but hopefully it has the possibility of finding its own origins again and even eating itself and challenging itself. That’s what we constantly have tried to do within the genre, is not try to make the same record twice, or if we have an album that’s strong, we haven’t tried to duplicate it, probably to our detriment. But that’s what we’ve done. Max Ink: After watching some clips on youtube of your recent live shows, the outfit that you wear onstage isn’t very revealing of who is underneath the mask. It could be anyone under there. NO: Yeah, it could be someone from American Idol! (laughing) I could hire a prop singer. Max Ink: Well, what I noticed is that when the mask comes off, you aren’t covered with all kinds of goo and blood and stuff like that, the way you typically were in shows of the past. NO: Well, a funny thing happened to me, and it actually showed up on the Maniac shoot, because I got doused with blood in the shoot out of an air canister. No one else got sick. It may have been that I was the first one to get shot with it, and that canister had been full of blood all day and there was tons of bacteria in it, but I came home from that shoot with pharyngitis and conjunctivitis. I’ve noticed that over the years, because I’ve used blood for over 26 years, that whatever the chemicals are in it, I may have developed an allergy to it now. So within the context of this, there is blood used but it’s used in a different way. I think in a quite spectacular way, I really enjoy it. It’s not really getting all over me now necessarily. The problem with using a lot of blood like that is that it’s very hard to control in the sense of where it goes and it’s very sticky. Also, once it gets on your face, it gets into the windshield on the microphone and it ultimately degrades the performance of the vocals. This tour, for me, I really wanted to concentrate on the vocals, which I haven’t really done for any other Skinny Puppy tour. I am a bit encumbered with the mask to a certain degree, which means that I have to find a sweet spot to sing but not having all that to deal with has been a bit of a gift to me. At this point, there’s still blood on stage and there’s blood happening, it’s just not necessarily all over me, honestly, for health reasons. I also had a tour where we bought blood that was supposed to be safe for the mouth, it had photo-flo in it, which is a chemical used in photography when mixing chemicals so that it goes over the entire paper evenly. I was drinking that, it was going in my mouth and I was coming offstage and I was vomiting. I think that’s affected me too, in a lot of ways, so I’m just trying to stay one step ahead of not coming back from touring and having to go to the hospital. Max Ink: That hat that you wear onstage, someone told me they thought it looked like a dunce cap. NO: It is. It’s two-fold. There’s a hint of a scarecrow and a KKK semblance to it and also a dunce cap so that’s a very astute observation. At the end, it becomes more of a dunce than angry. I see a lot of hidden racism and when it explodes, it’s very violent and not really being talked about or dealt with. When I do that costume, I really wanted to touch on that and there’s visual elements going along with it that are very blatant about that but the idea of it just being that is not true. It’s more abstracted and polarized between both of those realms, the realm of something powerful and the realm of something stupid. Max Ink: You were pretty outspoken about your dislike of the Bush administration. What do you think of President Obama? Max Ink: You’ve also been an outspoken advocate for animal rights. Are you a vegetarian? NO: I was for 14 years and I got really sick and I’m not anymore. My justification for that is, I really don’t believe in factory farming and vivisection to me is that something that needs to be addressed because it’s a commodification of animals and life which I don’t believe in, but I can’t slight people for eating meat. Native cultures have done it forever and they revered animals and I think that’s the change that needs to take place. How you deal with all this stuff, I mean you will never stop people from eating meat, we’ll never go back to that golden age of Christianity, which is the story, but at the same time we can modify some of the ways of how we process and look at animals. To me, I have a very basic tenet, very deep, deep, deep core spiritually, I’m the type of person who escorts flies out of the house. If I see a fly bang it’s head against the glass, I’ll catch it and take it outside and release it, or anything like that. I’m weird like that. I think if we all took a step back and treated animals better, it would ultimately have a resonant effect upwards towards our own ilk in a lot of ways. I think you can modify things, but you’ll never change people into becoming vegans or vegetarians, not everyone, but it’s a very idealistic goal. I’ve seen too much in-fighting within the groups, and I also just think that as a species, we’re omnivores. You’ll never be able to convince everybody of the whole thing, but how we treat animals and how we farm them and how we raise them can be modified. It might cost people more money but I think we spend too much time of our lives working from this old economic theory based on a German physicist who was proven wrong in the 1800’s, that nature’s resources will always be plentiful and resupply themselves indefinitely. Max Ink: Who do you think is putting out great music right now? Max Ink: If you could’ve written any song that has already been written, which song would you choose and why? NO: Witchcraft by Frank Sinatra because Frank had a way with words. Max Ink: What three things could you not live without? NO: My girlfriend, my dog and Bio-K! Max Ink: For what in your life are you most grateful? NO: I’m grateful for our fans, because without them we wouldn’t be where we are. I’m grateful that I can do what I love doing every day. I’m grateful for my girlfriend, because I’ve learned a lot and I’m in a really healthy place right now. Max Ink: What would you like to be doing five years from now? NO: I’d like to still be playing music, of course, and I’d like to hope that my acting career would be a big part of my life also. I never thought I’d still be doing this at my age, but I wouldn’t change it and I hope I’m still doing it in the future.